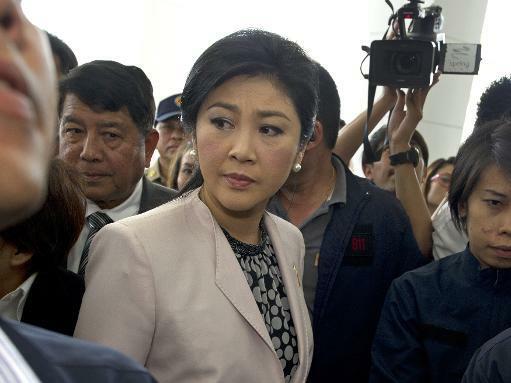 Thai Prime Minister Yingluck Shinawatra testified Monday in front of anti-graft officials over negligence charges that could lead to her removal from office and a ban from politics. Observers say that after months of street protests, the kingdom's political crisis is lurching towards a critical new phase, with the NACC appearing set to move against the embattled premier. "The prime minister gave verbal and written testimony... she asked the NACC to question 10 more witnesses and give more time for her lawyers to submit more evidence," commission member Prasart Pongsivapai told reporters. "We will discuss both of these requests tomorrow... we are glad that she came, the atmosphere was good," he added. But Prasart refused to be drawn on a possible timeframe for the NAAC's response and denied accusations that the commission had sped up the process to assist the anti-government movement on Bangkok's streets. The issue has become a lightning rod for Yingluck's political opponents who have massed on Bangkok's streets for months in a bid to topple her government. They accuse the NACC of failing to complete a near four-year-old graft case against former premier Abhisit Vejjajiva, while a welter of graft cases against Suthep Thaugsuban -- the firebrand leader of the anti-government street movement -- also remain unheard. In recent days Thailand's upper house Senate, which would preside over any impeachment proceedings, has moved onto centre-stage of the political drama. Polls for the elected portion of the Senate -- representing a narrow majority of the 150-seat upper house -- were held on Sunday. Anti-government protesters appear to have pinned their hopes of ousting Yingluck on the kingdom's legal agencies and the upper house. "The NACC is an independent body... but I'm sure it will provide justice over the case," their spokesman Akanat Promphan told AFP. Pro-government "Red Shirts" have vowed to fight any attempt to remove Yingluck from office, promising a show of force on Saturday after weeks of relative quiet. "We have practised strategies... If there is a coup there is likely to be bloodshed," one militant Red Shirt leader from a province in northeastern Isaan told AFP, requesting anonymity. The Red Shirts' street rallies against the previous government in 2010 resulted in bloody street clashes and a military crackdown that left dozens dead.